It's all about Mom! From glamorous gifts to fabulous fashions to everyday essentials, you'll find something that will make her day...and yours too. Dress up your downtime with the chic and comfy off-duty looks from Avon Signature Weekend on page 134. Get your lips kiss-ready, just in time for spring, with a fabulous new shade...or two on page 42. Get remarkable results with Anew Ultimate, Avon's breakthrough brand that sets the standard in skin care on page 76. 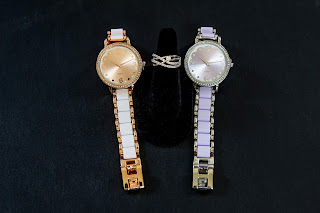 The new Ladylike Bracelet Watch is so beautiful I had a really hard time deciding which color to get, ultimately I could only narrow it down to 2, and I still may order the blue and goldtone version. I especially like the scallop design on the face. It's worth noting that the contrast on the numbers is different on each color combination with the blue and goldtone being very easy to read and the white and rose goldtone being the hardest to read. Each watch includes 2 extenders so you can easily adjust the size for just about any wrist. I also got my first piece from the Signature Brilliance jewelry collection. I picked out the Layered CZ Ring and it is gorgeous. The intertwining "strands" give it a very soft and flowy look. The last thing in my order this campaign is the Advance Techniques Reconstruction 7 Shampoo and Conditioner. My daughter has very long hair and she uses this shampoo and conditioner to repair the damage done by coloring her hair. It helps smooth split ends and reduce breakage so her very straight hair stays smooth and soft. Snuggle up with the warm and comforting fragrance of silky vanilla. This set is perfect for taking a time-out. Begin with the Bubble Delight Vanilla Cream Bubble Bath, a rich and creamy soak with 24 pampering baths in every bottle. Enjoy the White Sandalwood Candle, with notes of soft citrus, sandalwood and musk, and the shower pouf while bathing to increase the spa like vibe. Follow up with the Silky Vanilla body lotion and body spray, to leave skin feeling velvety smooth and refreshed with 30-hour moisture. The 5 piece set is available for a limited time at only $19.99, a savings of $27. Add some Glimmer and Shimmer to your everyday wear. Glimmersticks Eye Liner gives you beautiful stay put colors, you can wear all day! The dazzling colors define and enhance your eyes! The retractable, self-sharpening eyeliner creates a perfect point that allows for easy precision application. Stay put eyeliner wont move or face and is perfect for long wear! Add an extra sparkle to your eye with Glimmersticks Eyeliner. • Each, .01 oz. net wt. Check out the Golden Deals and Mother's Day Flyer flyers for even more special deals on makeup, fragrance, jewelry, and personal care.